Political scientist George La Noue terms Ethical Imperialism "a powerful indictment of the IRB regime." La Noue, who has himself written about the IRB controversy, notes that "Universities might seem to be a most unlikely place to welcome and implement a process that is in effect a form of prior censorship. Reconciling the IRB process with legal or professorial concepts of academic freedom is extremely difficult." 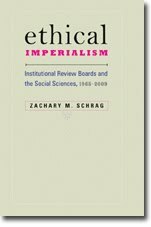 He finds that "Schrag provides a carefully researched and well written historical perspective providing all members of the academy with essential information to reconsider the role of IRBs." What is missing is comparative empirical research about the standards and procedures of a variety of IRBs in different settings. While it seems intuitively unlikely that the process is always fair, objective and consistent, from IRB committee to committee, campus to campus, beyond anecdotes what proof exists? Without an appropriate factual basis, courts would struggle with both the compelling interest and narrow tailoring prongs that constitute the strict scrutiny test that should apply to censorship. Schrag’s book provides a necessary and very carefully researched historical context for the debate about IRBs, but the next step needs to be taken by professional associations and social scientists to study their actual practice to see if the current system can be improved. I concur, though I would suggest that we in fact need two separate branches of such emprical study. One would continue the work of Maureen Fitzgerald and Laura Stark, both of whom have observed committees in action without finding huge variation from campus to campus, or even--in Fitzgerald's case--country to country. A second branch would look at the development of human research protections policies. Read through this blog, and you will find enormous variation in casts of characters involved in shaping university policies on human subjects, from research offices that feel free to make up whatever rules they want, to the participation of university-level faculty committees, to the involvement of departments most affected by a given policy.. I don't know of any scholarship that has examined this variation in depth. I hope that other scholars heed Professor La Noue's call.